Mighty Campers offers as much as you can, for as little as you like! As a division of Tourism Holdings Ltd., which has more than 20 years experience with campervan hire in Australia, Mighty can accommodate rentals from nine depots. Mighty offers 6 different vehicle types for up to 6 people at 9 rental depots throughout Australia. All vehicles are frequently serviced to ensure your safety. The vehicle must be returned with a clean interior, otherwise a fee of AU$ 250 will be charged. This includes smoking related cleaning, as smoking is not permitted in any of the vehicles. Waste water tanks and toilets must be emptied prior to drop-off (unless you purchased the Express Return Option locally), otherwise another fee in the amount of the Express Return option will apply. This option can only be booked in advance, is charged for a maximum of 50 rental days and cannot be purchased on arrival. Long-hire discounts do not apply to the All Inclusive supplement. You can see the prices for this option during the online quoting / booking process on our website. With your travel documents you will also receive the internet link below which enables you to complete your online pre-registration in advance. You can use this form to complete all necessary details such as booking number, name etc. for Mighty so that they can prepare your rental agreement in advance of your arrival and have it ready for you to sign as soon as you arrive to pick up your vehicle. For rentals of 21 days or more, an 8% discount is applied to the rental rates. Please note that the All Inclusive option cannot be discounted. Should a customer have more than one consecutive rental, these can be combined to qualify for longer-term hire discounts off the vehicle rate. Consecutive motorhome hire in Australia and New Zealand for Britz and Maui can be combined to qualify if the vehicle collection date/s are within a 3-month period. For all rentals to qualify, each booking needs to be made at the same time. If a customer makes another booking at a later time, the new booking can be combined to qualify if the vehicle collection date/s are within a 3-month period. However, the original booking/s will only qualify for a discount if the booking/s are not already travelling or have travelled. If multiple hires are within the same country and total days exceed 50 days only the maximum charge applicable to the 'Liability Reduction Option' insurance or All Inclusive option will apply. If combining a vehicle hire with another Mighty Campers vehicle that has a more expensive All Inclusive option, the more expensive All Inclusive maximum cost is applied. In the instance where a Mighty Campers hire is being combined with a Maui or Britz hire, the All Inclusive options cannot be combined to have a maximum charge applied however the vehicle rate can have a long-term discount applied if applicable. Please note that the Broome and Hobart surcharges in Australia are charged for each individual rental where Broome and Hobart are components of the booking. The long-term hire discount applies for the sum of all rental days together. However, the one-way fee is charged separately for each individual rental. Vehicle security deposits can be transferred between most multiple rentals. This service is available when the vehicle deposit amount and currency is the same. If multiple hires total more than 100 days these rates and terms do not apply. Requests for quotes/bookings of more than 100 days should be made with us first by email or phone. The flex rate that is available at the time of booking determines the daily rental rate. This price that applies from day one of your rental duration then applies for the entire rental period up to the 7th day. Every rental day from the 8th rental day on are counted as a new booking and the flex rate that applies for the 8th day will be used from then on, and the flex rate that applies for the 15th rental day will be used from then, etc. As soon as you have booked, that rate is fixed, i.e. the price you pay per day will not change, even if the flex rates change at a later date. For bookings of 5 vehicles or more or for long-term hires of 100 days or more we will need to place a special request with Mighty Campers as other prices and conditions may apply. This also applies to multiple hires that add up to 100 days or more. Please note: If you decide to extend your rental duration before you actually collect your vehicle, the same flex rate is used to calculate the additional rental days that applied on the day when you made your original booking as long as the original pick-up date has not been changed. Moreover, if you decide to add the All Inclusive option at a later date this can be done without changing the flex rate. For all other changes to your booking, the booking will be re-calculated by using either the original flex rate or the flex rate that applies at the time of the booking change, depending on which rate is higher. 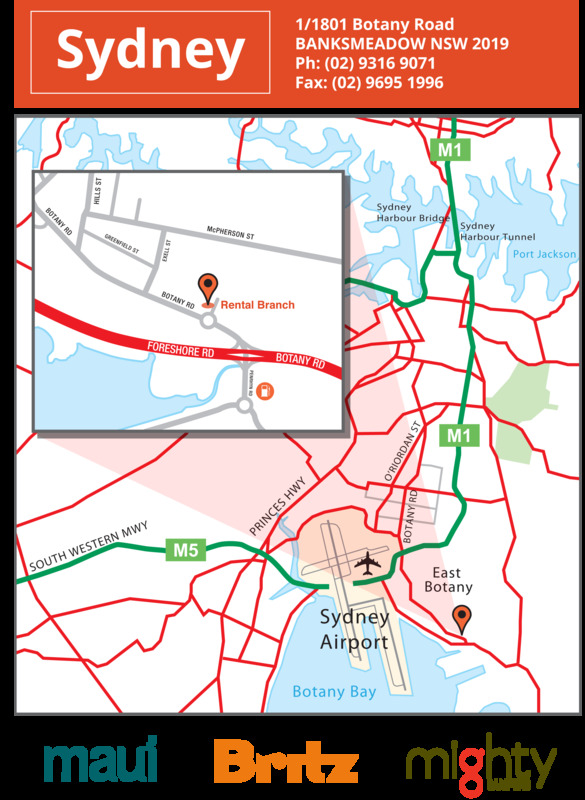 One-way rentals are available between all Australian depots and in all vehicle categories upon request with advance bookings. The one-way option is allowed as long as the minimum hire condition between 7 and 28 days is achieved. The table outlining the minimum hire conditions can be found below under 'Driving Restrictions'. - a one-way fee of AU$ 165 applies to one-way rentals where pick-up originates from Cairns, Brisbane, Sydney, Melbourne, Hobart or Adelaide and also returns to one of these locations. - a one-way fee of AU$ 250 applies to one-way rentals that originate from Darwin, Alice Springs or Perth or end in one of these depots. And it applies to one-way rentals that originate from any location and returns to Darwin, Alice Springs or Perth. For multiple rentals within one holiday, the long-term hire discount applies for the sum of all rental days together. However, the one-way fee is charged separately for each individual rental. Baby and booster seats are compulsory for children up to 7 years of age. Please note that only booster seats suitable for children from age 4 can be installed in most Mighty Campers. Only the Double Down, Double Up, Deuce Plus and Big Six allow for a baby seat to be installed. If you require one or more child seats, please let us know the child's age and weight when you book. A fee of AU$ 36 is charged per seat and rental. For further information on this subject please refer to the section 'Equipment & Extras' below. Australian GST (Goods and Services Tax) of 10% is included in all standard rates you pay us as well as 3% Administration Fee. For any amounts payable in AU$ at the depot, the following sales taxes are charged in addition to the cost: 10% GST, 3% Administration Fee. Motorhome Bookers has sought to provide this tax information as accurately as possible. However, we cannot be held responsible for any changes that come to light such as new additional fees charged by the rental company at pick-up time or local tax increases made by the country in question. The standard insurance is included in the rental rates. The third-party element of this insurance comes with a maximum cover amount of AU$ 20 million and covers bodily damage inflicted upon a third party. There is no insurance cover for injury caused to the renter or passengers of the rental vehicle and Mighty Campers do not provide an insurance option for this. The renter is liable for an excess of up to AU$ 3,500 for the Highball and Double Down and AU$ 5,000 for the Deuce, Deuce Plus, Double Up and Big Six (per incident) for vehicle damage in the event of an accident. This applies to any material damage to third-party property of the rental vehicle, regardless of who causes the accident. This liability remains in place until a third party admits liability and makes a payment to cover costs incurred. - The All Inclusive Option can be booked in advance through us (see 'Inclusions' above - only available in advance - not at the depot). This option includes the 'Liability Reduction Option' insurance supplement as well as 'Single Vehicle Rollover Cover'. - Alternatively, you have the option of purchasing the following insurance option locally as outlined below. * = first amount is valid for Highball and Double Down/ second amount is valid for Double Up, Deuce, Deuce Plus and Big Six Campervans. * = First amount is valid for Highball and Double Down/ second amount for Double Up, Deuce, Deuce Plus and Big Six Campervans. ** = Time required to repair a vehicle, costs incurred as a result of a vehicle not being able to be rented out due to damage. If you rent a motorhome with Mighty Campers on more than one occasion within the same holiday period, the long-hire discount applies off the total number of rental days for hires in Australia and New Zealand. For several hires within one country, you will pay no more than 50 days hire for the 'Liability Reduction Option' insurance (which can be purchased locally) or the All Inclusive option, but these are not discounted. For combined Australia and New Zealand hires these options are not cumulated, but rather are calculated separately and charged rental by rental. With the standard insurance, the deposit (which covers the level of the excess) can be provided by credit card only (Visa, Mastercard and American Express are accepted). Pre-paid credit cards, cash or travellers cheques are not accepted. The owner of the credit card must be present and sign when providing the deposit and he/she is liable for any damages to the rental vehicle. This deposit can only be provided by the renter named in the booking and it cannot be spread over 2 or more credit cards. All credit card payments are made in Australian Dollars. With any transactions made using a credit card including providing your deposit with your credit card, administration charges of 2% for Visa/Mastercard and 2.8% for American Express will apply in addition to the standard payment amounts. If the vehicle is returned undamaged and in good condition, credit card surcharges applicable to vehicle security deposits are refunded when the vehicle security deposit is refunded (only applies to payments made with VISA or Mastercard). Neither the rental company nor the tour operator is liable to pay any cost differences resulting from foreign exchange fluctuations or external fees, which occur between the cost of the deducted deposit and the reimbursement . The deposit is deducted from the credit card when you collect your vehicle and is returned to you when you return the vehicle if the vehicle is returned without any damage or third party incidents having taken place. Any fluctuations in foreign exchange rates or fees are borne by the renter. With the Liability Reduction Option or if you book the All Inclusive Option through Motorhome Bookers, an imprint of the credit card is all that is required at pick-up time. The customer authorises Mighty to charge any fees such as cleaning fees, speeding or parking fines, rental extensions etc. The deposit will be reimbursed in full as long as the vehicle is returned in the same condition in which it was collected, with full petrol/diesel and LP Gas tanks. The rental company reserves the right to charge a cleaning fee of AU$ 250 if the interior of the vehicle is excessively dirty at drop-off. This fee can also be charged for smoking related cleaning. The toilet and waste water tank must be completely empty (unless you purchased the Express Return Option locally), otherwise a further fee in the amount of the Express Return option will be charged. The excess is always banked in the first instance, regardless of who is at fault and is owed to the rental company by the renter. It applies per incident and if a further accident occurs, a separate deposit is then payable to the same total. The excess is refunded to the renter if a third party admits liability and makes a payment to cover the corresponding costs. However, this can take some time. Accidental damage to the vehicle (excluding damage caused by the vehicle rolling over) and to the property of third parties, towing or recovery costs following an accident, damage resulting from theft, a burglary or fire. Any revenue the rental company loses as a result of the vehicle being repaired following such events is also taken from the excess. All insurance cover is null and void if the terms of the Mighty Campers Australia rental agreement are breached. Any damage that is caused when the renter acts outside of the rental company conditions is not covered by any insurance. Any damage caused by the vehicle rolling over where the renter is at fault, is not covered by the insurance unless the All Inclusive Option is booked in advance. A vehicle rollover is deemed to have occurred where damage to the vehicle results from the vehicle rolling or tipping to such a degree that any or all tyres lose normal contact with the road surface. The insurance does not cover damage in the case of (salt-)water related damage, vehicle submersion, the vehicle being stranded in a water area, driving through causeways or beach driving. Damage to the underbody, roof or roof appendages is not covered unless you have purchased the 'Liability Reduction Option' insurance or the All Inclusive option. Whilst we appreciate accidents may occur, there are also clearly cases of driver negligence where any insurance coverage is voided. This includes incidents where the driver is found to be in breach of the law in terms of speed, alcohol, drugs, or is found by the police or investigating authority to have been driving in a dangerous or negligent manner. In all such instances, Mighty Campers reserves the right to pursue full recovery from the renter. If you provide a deposit via credit card an administration fee will also apply in line with the amounts mentioned above - on top of the deposit amount. Please be aware that these are refunded with the deposit amount if you use Visa or Mastercard but are not refunded if you use American Express. If the deposit is kept by the rental company, these fees will not be refunded either, regardless of which credit card you use. Neither the rental company nor the tour operator is liable to pay any cost differences that occur between the cost of the deducted deposit and the reimbursement resulting from foreign exchange fluctuations or external fees. Where speeding tickets and parking fines and/or accidents (e.g. that have not been mentioned to the rental company) come to light the rental company reserves the right to invoice the customer for these costs in arrears as well as a processing fee of AU$ 60 or charge their credit card. It is compulsory to have a valid and full national driving licence (no probationary license) in order to be allowed to drive in Australia. If your national licence does not include the relevant details in English, an international driving licence will also be required along with your national licence. Drivers are required to have possessed a full and valid licence for at least a year at pick-up time. The minimum age for the Highball or Double Down is 18 years, for all the other vehicle types the minimum age is 21 years. Additional drivers can be registered at the time of vehicle collection for a fee of AU$ 2 per day and driver, up to a limit of AU$ 30. This is free with the All Inclusive option. Anyone wanting to drive the motorhome must have their details entered in the rental agreement. For hires over 100 days, Mighty Campers requires us to place a special request for pricing and conditions. This also applies for multiple hires that add up to more than 100 days. General vehicle equipment provided in the vehicle is included in the base rental rates and consists of: toilet paper, clothes pegs, hand-broom & dustpan, broom, fire extinguisher, bucket, water hose, scrubbing brush, matches, gas cylinder. The kitchen kit is also included in the base rates and consists of: plates, bowls, cups, glasses, knives, forks, spoons, bottle opener, frying pan, pots, cooking utensils, toaster, cutting board, jug, teapot and tea towels. Personal kits are also included in the rental rates and consist of (per person): 1 sleeping bag, 1 pillow with pillow case, 1 bed sheet, 1 towel. A first-aid kit is provided in every vehicle. If the safety seal is opened, the kit becomes the property of the renter and AU$ 35 will be charged at drop-off. Baby seats and booster seats are compulsory in Australia for children up to 7 years of age. Seats that are only attached to the frame of the vehicle (such as the middle seat in the front of most motorhomes) are illegal. It is not permitted to use child seats from UK/Europe or other countries that do not have the appropriate connection apparatus for motorhomes. Children under the age of 4 are not permitted to sit in the front seat of any vehicle. You can rent baby seats (for children under 4 years) and booster seats (for children from 4 - 7 years of age) for AU$ 36 per seat and rental. Please note that baby seats can only be installed in the Double Down, Double Up, Deuce Plus and Big Six campers. Booster seats can be installed in all vehicles, however, with the Highball, Jackpot and Deuce, these will be installed in the front seats which is not recommended. Please provide us with the age(s) and weight(s) of your children when you make your booking so that we can book the appropriate seat(s) for them. Baby and booster seats have to be booked in advance. The vehicles are only permitted for use on sealed roads. The only exceptions to this rule are the roads of less than twelve kilometres leading to campgrounds, major tourist attractions and well-maintained, recognised roads on Kangaroo Island (South Australia). Simpson Desert, Strzelecki Track, Gunbarrel Highway, Old Gunbarrel Highway, Cape York, the Bungle Bungles, Oodnadatta Track, Birdsville Track, Tanami Track, the Plenty Highway, the Burke Development Road from Chillagoe to Normanton and Savannah Way from Normanton to Borroloola, Fraser Island, Finke Road (between Alice Springs and Oodnadatta), Central Arnhem Road and Arnhem Land in general, Gibb River Road, Canning Stock Route, the Lost City in Litchfield Park, Boggy Hole (Finke Gorge National Park) and the Old South Road from Maryvale to Finke. Anyone who drives on unsealed terrain or in restricted areas does so at his/her own risk and the renter is liable for any costs including towing, vehicle recovery, etc that result from a breakdown or accident in these areas as there is no insurance cover there. Breaching the road restriction rules by taking a vehicle on an unsealed road or restricted road Mighty Campers will charge AU$ 300 per incident. Mighty Campers reserves the right to limit the approved driving areas at short notice on the basis of weather or other concerns about the conditions of certain terrain. A permit is required to visit several of the national parks and Aboriginal areas. It is up to the renter to arrange these him- or herself. One-way rentals (i.e. vehicle pick-up at depot 'A' and drop-off at depot 'B') are available between all depots and with all vehicles. The one-way option is allowed as long as the minimum hire condition between 7 and 28 days is achieved. You can view the depot addresses including distance information on the 'Rental Depots' page on our website. The opening hours vary for the rental depots depending on what time of the year you pick up or drop off your vehicle. All clients are requested to arrive at the rental depot no later than 30 minutes prior to closing time. All depots are closed on Christmas Day (25 Dec) and Australia Day (26 Jan). You can pick up your vehicle at the booked depot and during Mighty Campers' opening hours. Please do not arrive any later than 30 minutes prior to closing time. Please advise Motorhome Bookers of your preferred pick up time at time of booking. You can drop off your vehicle at the booked depot during opening hours but no later than 30 minutes prior to closing time. The Customer is required to drop off at the time stated on the Rental Agreement. If the customer wishes to change this time prior to the day of drop off, they must obtain authorisation from the Mighty Reservation Centre. Mighty Campers allows a grace period of 59 minutes after the scheduled time. If the vehicle is returned earlier than agreed no refunds are possible. If it is returned later than the agreed drop-off date the renter will be charged at the standard rental rates (which will not necessarily be flex rates). Extensions to the rental duration can only be made with the prior approval of the rental company at the standard rental rate, which is not necessarily the flex rate that was provided on the original booking date. This payment must be made immediately by credit card over the telephone for confirmation of the rental extension. If the rental duration is extended without prior approval a fee of AU$ 150 will be charged per late day on top of charges for all addional rental days at the standard rental rate. It is not possible to change the depot where you return your vehicle without prior approval from Mighty Campers. Otherwise, fees of up to AU$ 750 will be charged. If the vehicle is returned damaged or not in a clean state, if the toilet or waste water tanks are not emptied or the petrol or diesel tank is not full (except where Express Return Option has been purchased locally) the rental company will impose the listed fees and additional charges. The cleaning fee is AU$ 250 plus a further fee in the amount of the Express Return option in the case the waste water or toilet tanks have not been emptied. The transfer costs are not included in the base rental rate. You will need to pay for these yourself. The rental company will make every effort to ensure that the booked vehicle model is provided. However, it reserves the right, if due to unforeseen circumstances it has to provide either a vehicle of the same or a higher value without upgrade costs if the model booked is not available for any reason. Any additional costs such as higher petrol costs or ferry crossings costs, etc will not be reimbursed. This does not enable the renter to cancel his/her booking and there is no ground for compensation. Even though all vehicles have similar equipment and designs small differences in vehicle design may exist. All measurements and size indications are approximate values and are based on the information provided to us by the rental company. We cannot accept responsibility for any mistakes or human error in the provision of these details.This information on our website can be changed at any time without prior notice. The rental company reserves the right to charge a fee of AU$ 250 if the interior of any returned vehicle is excessively dirty. This fee can also be charged for smoking related cleaning. Toilets and waste water tanks (if the vehicle is equipped with these) must be completely emptied, otherwise a further fee in the amount of the Express Return option will be charged. Petrol or diesel and gas tanks must be full (except if you have purchased the Express Return Option). In the event of an accident, breakdown, technical difficulties (including problems with tyres) you are required to inform the rental company immediately and within a maximum time-frame of 24 hours on the toll-free service line provided (not guaranteed to work or to be free if called from overseas mobile phones). Apart from contacting the rental company (within 24 hours), you are also required to contact the police if you have any kind of accident. Third-party claims should not be agreed to. The police report needs to include names and contact details of any people involved as well as witness details and vehicle registration details of the vehicles involved. Note: If you do not inform Mighty Campers immediately about the need for a repair or other problem you encounter and if Mighty Campers is not given the opportunity to help you find you a solution no compensation will be provided. If the renter seeks compensation for any vehicle problems after the vehicle has been returned without having informed the rental company during the rental period no compensation can be given. A nationwide network of contracted mechanics are available in these cases. Small repairs and costs for the upkeep of the vehicle up to the value of AU$ 200 can be carried out without prior communication with the rental company and will be refunded to you at vehicle drop-off time. For repairs that will cost more than AU$ 200 you are required to inform the rental company before repairs take place in order to obtain their approval to proceed. All repairs can only be reimbursed upon presentation of a receipt. Pets or other animals are not permitted inside the rental vehicles, with the exception of guide dogs for visually impaired passengers. All information provided has been put together by us (Motorhome Bookers Ltd) in as much detail as possible and on the basis of the information made available to us. This information has been taken from the rental company's conditions which they have provided to us. Any additional conditions are included in the rental agreement which is entered into by yourself and the rental company. You will receive the complete list of rental conditions with your rental agreement, which you sign when you collect your vehicle. We cannot accept responsibility for any differences that may come to light between our list of conditions and those of the rental company.